True to the original. Highly detailed, colour accurate giclée prints on canvas, watercolour paper, acrylic, wood and an astounding number of other substrates will bring your art reproductions to an entirely different level. 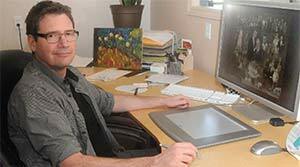 Oils and acrylics, charcoal and pencil sketches to photo compositions and mixed media… we can digitize art of pretty much any size. If it will fit in our studio (and it’s 3000 square feet) we can reproduce it. Stretched or framed canvas? No problem. Rigid originals, including impasto oils can be reproduced using our unique method of art reproduction. With over 30 years experience and clients which have included the Art Gallery of Ontario, and some of the finest artists in Canada, Butler has built a reputation for excellence in art reproduction and printing. Using our exclusive method of reproducing art, we can guarantee each piece of art is completely evenly lit and will capture all the detail of the original artwork. Examples of some of the art we have reproduced can be found on our art site – artextreme.ca. Each art reproduction is matched on-screen on one of our calibrated monitors and then test printed several times to ensure an accurate match. Pricing information. Our giclee prints are produced on a variety of materials: Canvas with museum quality varnish (stretched or not, your choice). Watercolour paper – hot pressed and acid free. We even print on metallic white paper. And of course heavyweight photo paper. All our giclee prints are archival quality using longevity inks. Our black and white prints can be output using only black and grey inks, eliminating the possibility of colour banding. Looking for dramatic? Try our specialty prints on metal, acrylic, wood, glass and much more. We’ve even printed on old vinyl records.